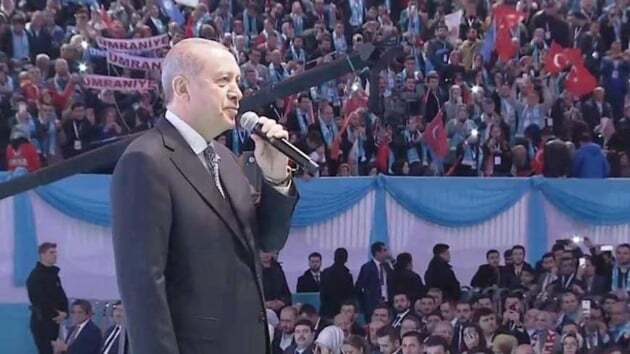 Turkey’s main opposition Republican People’s Party has a long standing tradition of rigging ballots during elections, President Recep Tayyip Erdoğan said on Sunday. ‘’If we don’t keep the ballot boxes safe, then we cannot prevent our efforts from being squandered… Trickery at the ballot boxes is the political style of the CHP,’’ pro-government Star newspaper quoted Erdoğan as saying during an AKP elections committee gathering in İstanbul. Erdoğan’s comments arrive as Turkey prepares to head to the polls on March 31 to elect choosing mayors and neighbourhood leaders throughout the country. Turkey’s strongman emphasised that staff who have gained administrative experience with municipalities are all part of the AKP while underlining the importance of ‘’administering justice’’ at the polls. Noting there would be a total of 195,000 ballot boxes throughout the country and 31,000 in İstanbul alone in the upcoming elections, Erdoğan said there will be over 280,000 staff working at the polls on March 31. Interior Minister Süleyman Soylu announced last month that Turkey is preparing to take extra safety measures for the local polls, with over a half-million security personnel slated to be on duty. The Turkish president also took jabs at the CHP over its ‘’coalition’’ with center right Good (İYİ) Party, the pro-Kurdish Peoples’ Democratic Party (HDP), as well as the Islamist Felicity (Saadet) Party. ‘’Look who the CHP is with right now. It’s with the HDP, which the terrorist organisation in Qandil supports,’’ Erdoğan said, in an apparent reference to the Kurdistan Workers’ Party (PKK), an armed group that has been in war in Turkey for over three decades. The HDP has announced that it will nominate mayor candidates in numerous cities, including İzmir, İstanbul and Ankara, in a move seen as the pro-Kurdish party’s support of the opposition coalition. Ankara accuses HDP lawmakers of harbouring sympathy and acting in the interest of the PKK.